Measuring approximately 46 cm (18 inches) wide and 185 cm (75 inches) long, this scarf is a cuddly accessory for the cold months of the year. It is worked continuously in a simple textured pattern. 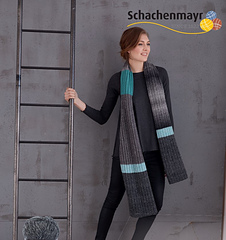 Interest is added by the combination of four different yarns and the contrasting turquoise accents which pleasingly brighten the various shades of gray. For our scarf we used Pieces, Soft Shimmer, Soft Mix, and Merino Extrafine 120 yarns to create an interesting, varied look and feel. The light chainette yarn is joined by a slight sheen and delicate fluffy texture as well as the clean stitches of the merino yarn. In addition, color gradations and jaspé effects lighten up the classic dark colors. This is a fashionable accessory in the mix&knit collection which can also be created in your own personal combination of colors and mix&knit yarns of the same gauge.